makes the best of dry fields. It does not support the drying winds. 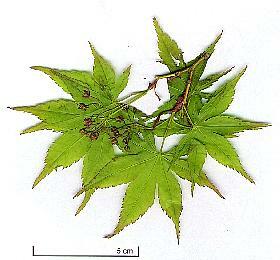 Small leaves in 5-7 red pointed lobes in autumn. Crimson flowers, in corymbs, in May-June. Small, red fruits with maturity, grouped. Small leaves in three lobes, red petiole rouge, 7 cm long. Red winged fruits and of nice red fire colour (hence its nickname, Fire maple) in autumn. Downy Japanese Maple or Fullmoon Maple (A. japonicum): leaves rounded, composed with 7 to 11 acuminate lobes (less deep than in A. palmatum), border with sharp teeth; 13 cm long (bigger than that of A. palmatum); downy short petiole; green colour turning to the red in autumn. A variety has leaves deeply laciniate.